So last night at pudding club, I opted for a new tactic – take ingredients and use our friends’ large well equipped kitchen to assemble a pudding on site. Soufflé, like chocolate mousse, is one of those things that looks really impressive, but is made with very few ingredients and is quite easy to make, particularly with an electric whisk. Unlike chocolate mousse, you have to get the oven timings right, which needs a little practice. And preferably, the same oven when practising as on the night. 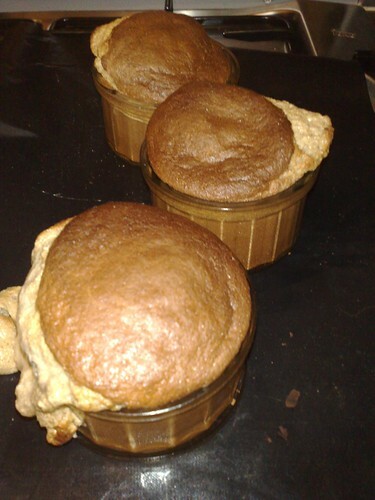 Come the evening itself, prepare 4 large ramekins: line with sponge fingers and sprinkle a little calvados over them. We have some fab calvados, bought directly from the farm in Normandy where it is distilled, so we always have a story to tell about the spirit. Pour the mix over the sponge biscuits and bake in a hot oven, 210 deg C for 9-12 minutes. It’s a soufflé, so don’t open the oven door until they are cooked. Hope you have an oven with a window! When they are cooked, the soufflé will rise quite considerably in height, and a skewer should come out clean. My effort last night wasn’t quite cooked enough, but still a little tasty. I think it could probably have stayed in another five minutes without burning too much on top. 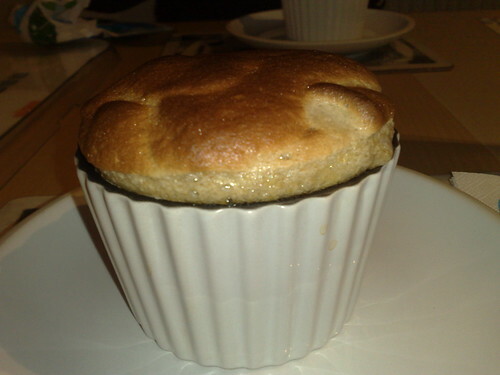 Another similar Eric Lanlard recipe is “Soufflé Pompadour” – which uses oranges instead of apples, and is cooked in the hollowed out orange shells, which are place in teacups to serve. Advantages of using friends’ kitchen and equipment? Délice au chocolat – fiddly, much? But a biscuit base made from praline and bran flakes?! PS, is it just me, or Raymond Blanc – Chris Noth – separated at birth? This entry was posted in Food and tagged pudding club.